Dressmaker’s Treasury is a collection of key tools and skills which every dressmaker needs for successful work. I am offering you a great instrument to help you acquire more confidence for fulfilling your creative projects! You will no longer have any fear of complex sophisticated garments! You will learn to work with mock-ups, make crinolines of non-standard shapes, and sew various kinds of fabric cases for petticoats to enhance the fullness of the main skirt. Our main goal at the Corset Academy is to teach you how to sew wedding and evening garments. And I want you to be able to sew a high-quality garment within a relatively short time. I don’t want you to spend lots of time on doing complicated calculations and making basic skirt patterns! Three tables for AUTOMATIC calculation of all parameters required for cutting a trapeze-shaped skirt, a half-circle skirt, and a full-sweep skirt (HTML). These tables contain 18 tabs for calculating necessary parameters for the mentioned types of skirts, horizontal and vertical ruffles, falbalas, and the elastic waistband skirt. Fixed parameters (i.e. 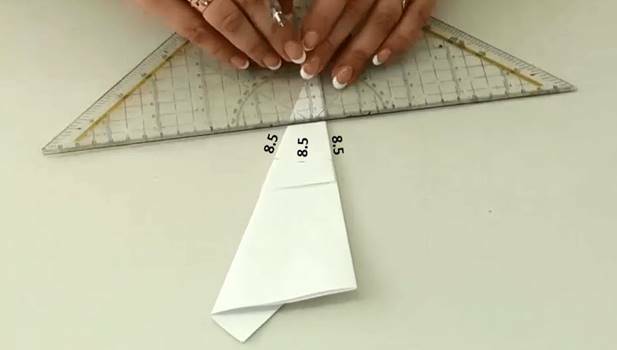 measurements) allow you to quickly calculate necessary data for cutting ruffles and falbalas for a skirt of a certain size: consumption of main fabric, lining fabric, decorative materials, etc. Our new course Dressmaker’s Treasury. Wedding Skirts and Petticoats is a collection of important methods and skills which every dressmaker must know in order to achieve good results. It will be equally helpful for beginners and for experienced professionals! Every professional dressmaker knows that sewing complex wedding skirts is not just about sewing together kilometers of fabric. The key thing is correct calculations and your ability to “foresee” the final results and related fabric consumption well before you start cutting and sewing. I would also like to emphasize that the skirt from this course is merely a foundation for your own masterpieces. Let your creativity bloom! The course is useful both to beginner dressmakers, as well as experienced professionals. I want to show you how to make a mock-up skirt with a train and circular folds. Let us use the same half-scale measurements we used in the previous calculations. - Number of Folds – 12. We have already figured out that we will get way too deep folds if we cut our skirt as a full circle. This option is only more unsuitable considering that our skirt will have a train. 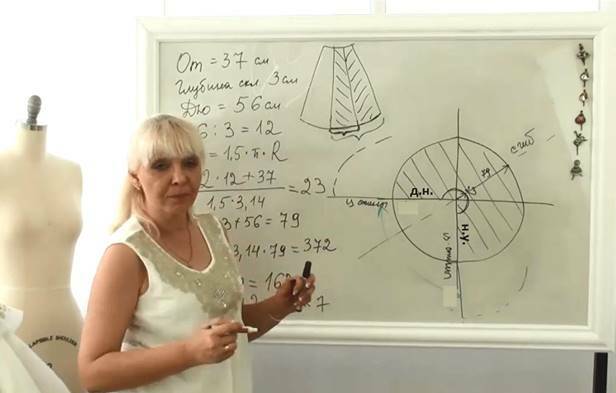 I suggest we calculate a 3/4 circle skirt just to have an example. This means that, if we look at a circle divided in four equal sections, our pattern will be represented by three of these sections. Let me remind you some maths basics before we start calculating. The number π multiplied by two is the radian equivalent of 360 degrees. If we multiply this radian equivalent by the length of the radius in centimeters, we will find the circumference in centimeters. In other words, 2π radians = 360 degrees and, therefore, you can always express the number of degrees in radians. Let us calculate the radian equivalent of 270 degrees. ). This can be done when you or your client find a 3/4 circle skirt too big. The above-described method can be used to calculate the radian equivalent of 240 degrees and devise a formula for the length of the corresponding arc of the circle. 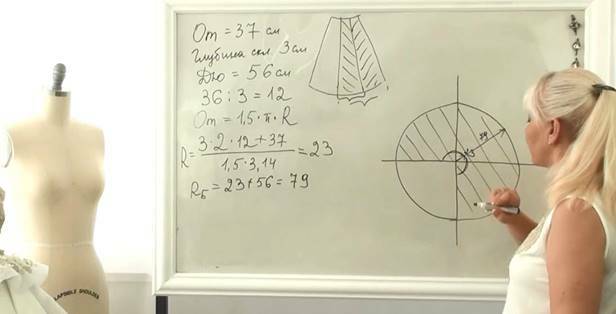 The suggested method allows you to draft skirt patterns based on any part of a circle and calculate the corresponding hem length. Now that we are armed with all that maths, let us continue our conversation about mock-up skirts. Let us start working on a mock-up skirt with folds based on three quarters of a circle. Now we need to calculate the depth of folds along the hem of the skirt and make sure that we are happy with it and that it does not go beyond reasonable bounds. We have chosen a full petticoat with a 210cm long bottom hoop for our skirt. We had to add 255cm to the hem length of the full-circle skirt to account for all twelve folds. We have reduced the length considerably by cutting the skirt as three fourths of a circle. The folds on our mock-up skirt are 3cm wide at the top (along the waistline) and 7cm wide down the bottom (along the hem). This 4cm difference is very good and proportionate to the skirt length of 56cm. A difference of 8cm is also very nice. It will create a well-proportioned flare on a 112cm long skirt: not too big and not too small. It is time to talk about the pattern. We will get it by folding in half the hatched three quarters of the circle. The front vertical midline will go parallel to the fold line. It is hard to say where the side seam lines will be positioned at this stage, but the central edges of the back will go along the straight edges of the piece dividing the train in two equal parts. When you are cutting your skirt this way, one central back edge goes along the lengthwise grain (l.g.) and the other central back edge – along the crosswise grain (c.g.). It does not matter how lengthwise grain and crosswise grain are positioned as long as your fabric is not iridescent. There will be no change in the shade of the train when you join the central back edges. But in most cases, the shade of fabric does depend on the direction of grain. In other words, if you cut your skirt by following the suggested method with lengthwise grain along one edge of the back and crosswise grain along the other edge, you will certainly get a train made of two absolutely different looking halves. And this means you need to design the pattern so as to have its lengthwise grain parallel both to the central edges of the back and to the vertical midline of the front. I will roughly draw the side seams now just to divide the skirt (green lines). Make sure to add some extra length to the side seams to provide for a smooth transition from the train to the front and to help the skirt settle beautifully over the floor. I will highlight the front half of the skirt with a red line and the back pieces with the train with black lines. Our task is to keep the lengthwise grain parallel to the front fold line and to both central edges of the back when we cut the skirt. 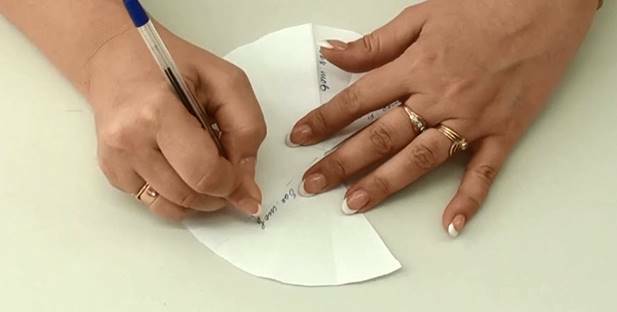 Let us imitate the process on paper to get a clearer idea of the final outline of our skirt pattern. 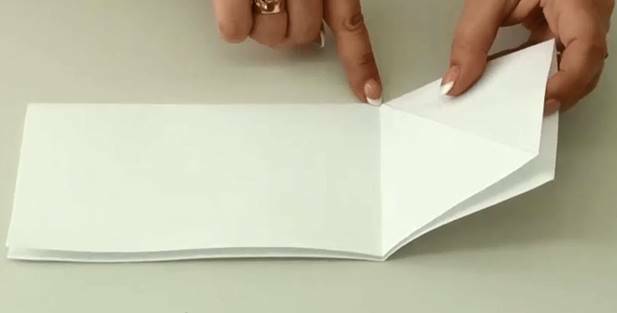 I will take two pieces of plain white or squared paper, fold each piece in half lengthwise, then fold one corner so as to make a square, and fold again to highlight the border of the square. 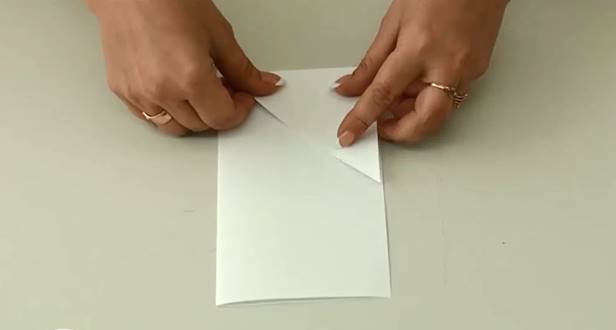 I fold the second piece of paper the same way. 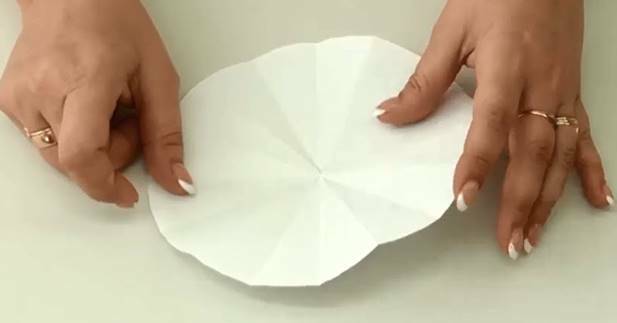 I continue folding the paper as shown in the pictures below. I keep folding the paper carefully aligning its edges. 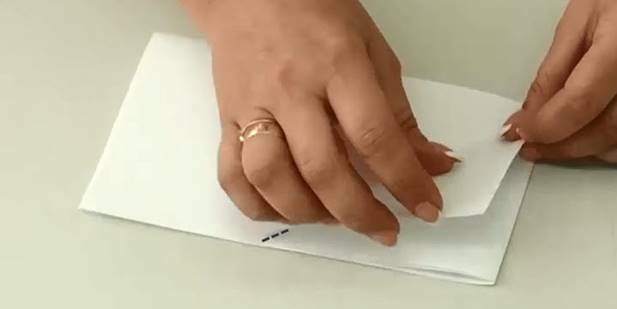 I do it as many times as the thickness of the paper allows. I turn it around after every new fold. This is enough. I have folded it into a triangle of the required size. I mark 8.5cm from the top point of the triangle: down either side and down the middle. 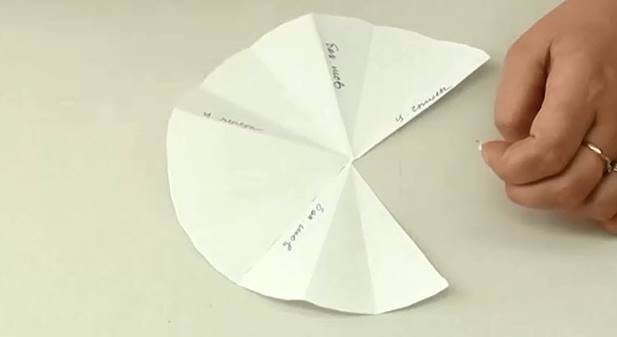 I connect the found points with an arc, cut off the top part, and unfold the resulting circle. I remove one quarter of the circle and leave three quarters there. Then I fold the piece right in half and find and sign the front vertical midline and the central back edges. Next we need to find the side seam lines. I fold the piece in half one more time. The resulting fold lines are the side seam lines of our mock-up skirt. I sign them too. I have found and signed the side seam lines, the front vertical midline, and the central back edges of our pattern. Now I cut along the side seam lines. What I get as the result are one front piece and two back pieces. If you put the two back pieces together, you will have before your eyes the back half and the front half of the skirt. I take the second piece of paper. Since the squares were folded the same way on both pieces of paper, they are absolutely identical in size. I put the front skirt piece over the folded piece of paper: right to the corner of the square, aligning their fold lines. I transfer the side seam line onto the paper making it a little longer (purely by eye for now) and re-draw the bottom edge of the front. The lengthwise grain is parallel to the fold line. I put down one back piece aligning its central edge with the fold line of the paper. This way the central edge is also parallel to the lengthwise grain. I outline the piece with a dashed line. I need to even out the side seam edges of the back and the front. I cut out the front piece, align its side seam edge with that of the back piece, and adjust the length. I sign the side seam line. Then I mark down a roughly estimated train length. We don’t have a precise value yet. Then I sketch the bottom edge of the skirt. We cannot define the configuration of the train more precisely at this stage: there are folds at the back of the skirt and we have no idea how they will behave at their transition from hanging down vertically to lying on the floor. Considering that we can’t yet tell what the train will look like, I suggest we cut it as a rectangle for our mock-up. We no longer need the initial patterns we used for drawing the key parts of the mock-up skirt. We now have schematic patterns which can be used for reference in the cutting process. The main requirement, i.e. keeping the central back edges and the front midline parallel to the lengthwise grain, has been fulfilled. I have also marked down the radii necessary for the actual cutting process. It is enough to even keep the pieces unfolded to double-check all inclines and angles on the actual pattern.